Traditionally, the last post of the year is my year round-up. For the third time in a row I created a compilation video with short excerpts of all my 2017 videos. You may find something you’ve missed during the year, or something that you would like to watch again or read again. For that reason, all the scenes have information in the bottom left corner, indicating what post the clip is from and from what date that post was. It should be easy to find what you are looking for! 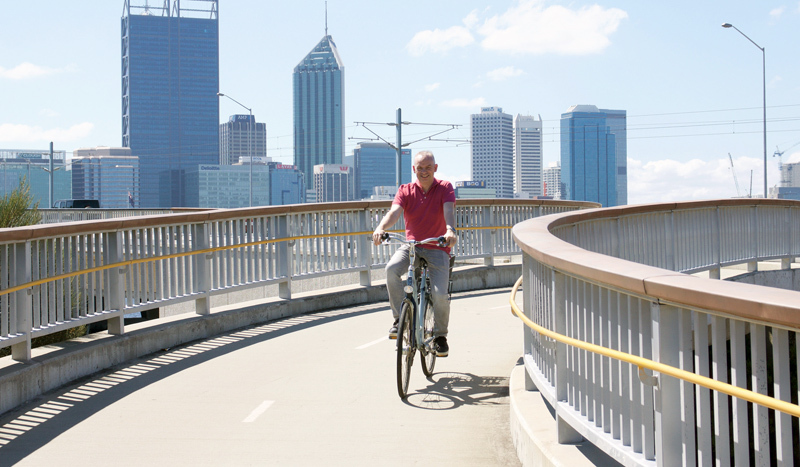 After the official program in Australia ended, I cycled Dutch style again, on a Dutch bike, in Perth and Fremantle, with Tim Burns from Bicycle Perth, who also took this picture. Certainly one of my top days of 2017! What a year 2017 was! I published 50 posts (not counting this one) and travelled to Australia, Barcelona and Vienna to give presentations and to study the local cycling culture. On top of that the “whole world” seemed to have travelled to Arnhem and Nijmegen for Velo-City 2017. The Dutch took this international cycling conference so seriously that their head of state, the King of the Netherlands, personally came to open it. Without saying a single word, but he did open it! With so many cycling experts travelling to our country I got many requests for guided tours. I rode with individuals and with large groups and everything in between in Utrecht and ’s-Hertogenbosch. It was great to guide people from Munich, Platteville, Perth, Brisbane, Boston, Washington DC, Dublin, Upsala, Oslo, Ottawa and Barcelona. I also gave many presentations this year; to groups of students from the University of Pennsylvania, the University of Connecticut and Northeastern University of Boston. I also spoke to the students of the Planning the Cycling City Summer School, organised by the University of Amsterdam. Other groups I spoke to were delegations from Munich and Ireland and delegates of a meeting from the European Cyclists’ Federation. All these presentations took place in five different Dutch cities: Amsterdam, Rotterdam, Utrecht, Nijmegen and Delft. My presentations abroad were in Brisbane, Canberra, Perth and Barcelona. I think you will understand when I call this a busy year! 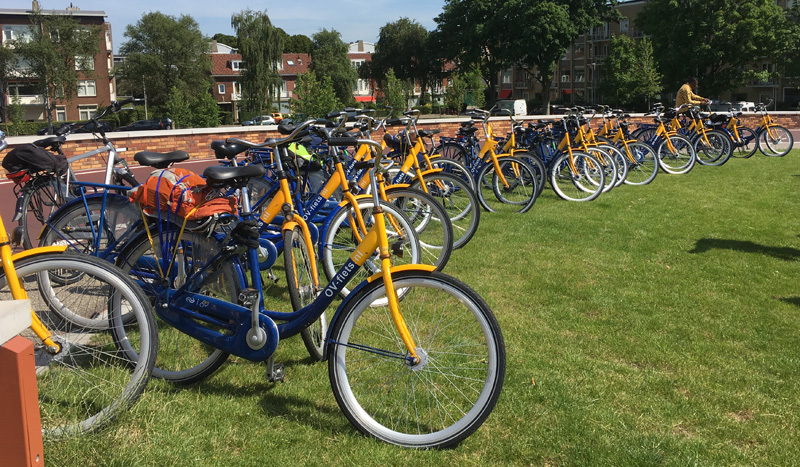 The rental bicycles (OV-Fietsen) of the summer students of Northeastern University in Boston on the access ramp of the Dafne Schippersbrug in Utrecht. This was the largest group I toured with through Utrecht this year. 26 people is a very big group! That that is even possible says a lot about the cycling infrastructure of Utrecht. Now back to the posts and videos. It is always good to see that the top 10 of most viewed posts is a nice mix of the many types of posts I have on offer. A look at people cycling, some pieces of big and impressive infrastructure, mundane infrastructure, home-side parking and end-of-trip-parking, explaining a policy and explaining something that could and should be improved. It is not so strange that Utrecht is the location of 6 of the top ten posts. Utrecht is doing very well and this city attracts and deserves a lot of international attention. I also like that the Barcelona Superblocks made it to my top ten. 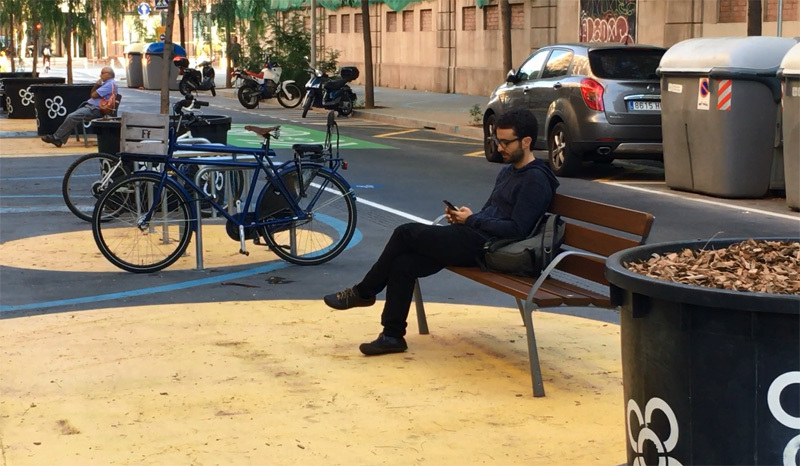 Although I see similarities with how the Dutch created traffic calmed areas in their cities, this Barcelona scheme is perhaps easier to relate to from some other cultures. In the Barcelona Superblock of Poblenou the streets were given back to people. Coincidentally I was in Rotterdam quite often this year. A city that especially North-Americans and Australians can relate to much more than to the average Dutch city. 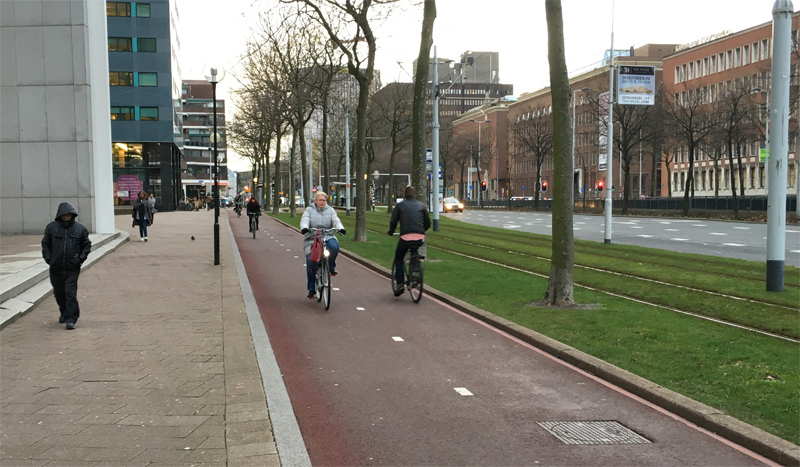 With the highrises and the wide streets, originally designed for motor traffic, Rotterdam can give people a glimpse of what their own cities could look like if cycling was taken more seriously. It is interesting to see that the 5 least viewed posts are often ones I called “short-posts”. The experiment this year with no-posts every other week was short-lived. The no-posts became short-posts and then the short posts became a lot longer again. By the end of the year I had returned to simply publishing a new post every week, like I did before. That wasn’t very clear to anyone and I won’t be doing that again. I will simply publish posts, sometimes longer and sometimes shorter, but no longer in a strict alternating schedule. Thank you for all your support by visiting the posts, watching the videos and writing comments and messages, here or on Twitter. Thanks to Velo-City 2017 I met even more of my followers in person this year than usually, which is always great. Many people gave me ideas for posts and others even decided to support me financially with a donation. Which I appreciate very much, especially because it makes all my travels in the country, to go to those film locations, possible! Unfortunately, I also disappointed people when I turned down their requests for tours or couldn’t answer all their questions. This is still a hobby and I have to do all the work for it next to my day job, I think you will understand that I often simply run out of time. Do make sure you visit my blog again next year. Even though the tenth year of making cycling videos is about to start, I don’t feel I will run out of interesting topics. 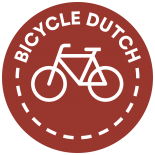 Also in 2018, I intend to keep on showing you even more Cycling in The Netherlands! Happy Holidays and have a great 2018! The video review of 2017. This still is from the 9th best read post: the reconstruction of an intersection in ’s-Hertogenbosch. Please come to Dublin Ireland to shoot a good/bad cycle infrastructure YouTube video. Don’t forget Dublin Velocity 2019. Just found your site. Loved the video! I wish we had cycling like that here. 2017 was quite busy indeed! It’s impressive how you manage to combine running a blog, giving tours and travelling the world to give lectures, with a daytime job. Personally, as a transport planner, this blog has been a great resource for me. As I’m working on street design projects and challenges on a daily basis, I often come here to look for inspiration. A lot of the time, that means studying how they’ve dealt with a specific spatial situation in Utrecht, and seeing how we can borrow bits and pieces of that design treatment where I work. You have a wealth of information on this blog and I know for a fact that many other transport planners who come here for inspiration. Keep doing what you’re doing. I’m looking forward to what you will write about in 2018! Thank you for one more year of inspiring and educative posts! Mark, you did an outstanding cycling job again in 2017; thank a million! Please keep up the super videos. I am a keen every day cyclist here in Ireland and I simply love all your wonderful content. Thanks for another year of great posts! This entry was posted on 19 December 2017 by Bicycle Dutch in Original posts and tagged infrastructure, small things, watching people cycling.